Johnny Carey, born on 23 February 1919 in Dublin, had a long and sparkling football career. He was one of the most respected Irish footballers to ever play in England. Carey played for Home Farm at under age levels and signed for St James Gate in 1936. While he was playing for the Dublin club he was spotted by former Manchester United goalkeeper and long-time talent Scout, Billy Behan. Behan recommended Carey to United and just two months after joining St James Gate he was sold to United for a then record Irish transfer fee of £250. Johnny Carey made his Manchester United debut on 25 September 1937 against Southampton. United were in the old Second Division at the time. In front of just 23,000 fans United lost by a 1-2 scoreline. Following his debut Carey retained his position in the Manchester United team for the rest of the season as the Reds reclaimed First Division status. The talented Johnny Carey had no difficulty in maintaining his position in the team in the higher division. At the outbreak of the second World War Carey adopted a highly principled position. He could have chosen to return to neutral Ireland for the duration of the war but instead he decided that "...a country that gives me my living is worth fighting for." He joined the British army and was posted to both Italy and North Africa. Full time league football was suspended for six years during the war years. Nevertheless Carey managed to play over 100 matches for Manchester United in wartime regional leagues. Upon the resumption of the Football League after the Second World War Johnny Carey returned to a greatly changed Manchester United. Old Trafford had been badly damaged by German bombing and the club had a new manager from Scotland, Matt Busby. A further difference was that Johnny Carey was made captain of Manchester United by Busby. It was an inspired decision by the manager as Carey proved to be an outstanding captain and performed the role until he left the club in 1953. Carey was a highly versatile player that played in almost every outfield position for United. He also played in goal once for the Reds as a stop-gap measure. In 1948 Johnny Carey led Manchester United out as captain for the FA Cup final at Wembley Stadium. It was United's first appearance in the FA Cup final for almost forty years. Blackpool, including Stanley Matthews, provided the opposition on the day and in their two previous meetings that season Blackpool held the edge with a win and a draw in the League meetings. Despite falling behind twice United prevailed winning 4-2 with two goals in the last ten minutes. It was Johnny Carey's first major honour. He won a notable individual honour in 1949 when he won the Professional Football Writers Player of the Year in 1949. Carey and United ended five seasons of frustration when the finally won the First Division League title in the 1951/52 season. United's League record in the seasons directly prior to this was second, second, second, fourth, and second. By finally clinching the title Johnny Carey became the first non-Englishman to captain an English team to both League and Cup victories. 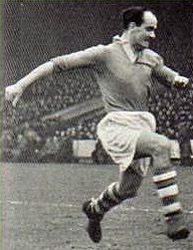 Johnny Carey scored 17 goals for Manchester United during his career. Playing as a defender he was not afforded many opportunities to get on the score sheet. Sixteen of his goals came in the League, nine of which he scored in his first two seasons when he was playing in a more advanced position. He scored his first goal for United on 28 December 1937 at the City Ground in a 2-3 win over Nottingham Forest. It was just his third appearance for the club. His one and only goal in the FA Cup came on 22 January 1938 in a 2-2 draw with Barnsley. Johnny Carey's last goal for Manchester United came at Old Trafford in a 2-1 victory over Blackpool on 26 December 1952. "Johnny Carey was a thoroughbred footballer who exuded class and calmness as Manchester United's first post-war captain and one of the most accomplished full-backs the British game has produced. A soft-brogued Dubliner who earned the epithet "Gentleman John" for his scrupulous fairness and unruffled demeanour no matter how dire the circumstances, Carey won every domestic prize available to him." Johnny Carey was one of a number of Irish dual internationals that represented both of the Irish teams in an era when it was possible to play for both Northern Ireland and the Republic of Ireland. Carey led the Republic of Ireland to one of it's most famous victories ever when the Irish triumphed 0-2 at Goodison Park in 1949. Carey captained Ireland as the Republic became the first non-UK team to beat England at home. Johnny Carey made his debut for the Republic of Ireland on 7 November 1937 against Norway at Dalymount Park in a World Cup qualifier. The match ended in a 3-3 draw. Carey made his debut for Northern Ireland after the war on 28 September 1946 in a 2-7 crushing defeat to England at Windsor Park. He went on to play for Northern Ireland on seven occasions with the following record: W1 - D2 - L4. Johnny Carey scored his first international goal for Ireland on 13 November 1938 at Dalymount Park in a 3-2 win over Poland. His other international goals came in friendly matches also - against Poland in 1932 and against Norway in 1950. His last match for the Republic was on 25 March 1953 in a 4-0 friendly victory over Austria. Uniquely Johnny Carey captained both Irish international teams. Between 1955 and 1967 Carey also served as team manager of the Republic of Ireland. However Carey had very little power as the team itself was chosen by a selection committee.